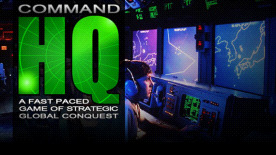 The initial release of Command H.Q. was met with great enthusiasm from strategy game fans. In fact, it was voted 1991's Wargame of the Year by Computer Gaming World. In this fast-paced game of strategic global conquest from award-winning game designer Dan Bunten, you'll control your own superpower as you attempt to outguess and overcome opposing superpowers in World Wars I, II, III IV, and V! You'll allocate your resources and troops. Gather military intelligence. And assume fingertip control of an awesome military arsenal that includes land, sea and air forces. All while grappling with the harsh realities and risks of nuclear war!